Nutrient film technique (NFT) is an advanced hydroponics method that provides a continuous flow of nutrient solution over bare plants roots. 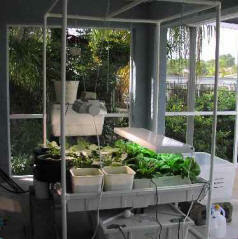 Oftentimes, when people hear the word, 'hydroponics' they envision an NFT system. For a homemade system this can be a pretty complicated. You would need a water pump, a container holding nutrient solution, a long trough of some sort to run the solution through (and back into the container) and some means to anchor the plants sitting in the trough. Plus, the trough must be set at such an angle that the solution does not rush through too fast, but again not too sluggishly. We have not personally experimented with a nutrient film technique system, but some gardeners swear by it. 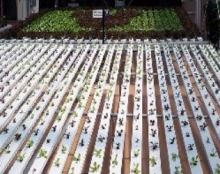 NFT is not as compact as other systems; mainly due to the long trough to grow plants in. Plants roots hang down into the trough (there is no growing medium) so without constant running solution to wash and feed the roots, they will dry out and the plant will die. In other words, a power outage can be disastrous in a short amount of time. Plant roots can easily clog the trough and impede the flow of nutrient. Frequent monitoring and trimming is necessary. Some NFT gardeners claim amazing plant growth and yield. Flexible & Versatile: is easy to modify, expand or contract the system configuration.Can be moved closer together or further apart to accommodate seasonal plant size fluctuations and/or crop modifications, i.e. going from Bibb lettuce to Basil bunches to Chives. very cost effective (after initial investment) and is very popular with commercial growers. GREAT SMALL STARTER SYSTEM: GREAT CHRISTMAS IDEA FOR YOUR "GREEN THUMB"
Here's a great little starter unit to get your feet wet. This is NOT a durable, large permanent system for a serious garden; however, it IS great to see how deep your interest and passion grow. "I received this item, although I thought I had ordered the smaller system (Emily's hydroponic garden system) which has only 6 plants. I was a little hesitant at first since it was much bigger than I expected, but after putting everything together I am very satisfied. The instructions for assembly and use are excellent, but missing teeny details here and there (for example: in order to install the pump you have to cut a very small hole in the red plug). Otherwise everything you need to start a hydroponic garden is included in the box (minus a light source, of course, and an acid solution to adjust the pH of your water if necessary). I have started many seedlings and other small plants in the system and I am planning on transplanting some plants from my outdoor garden as well. The seedlings are growing faster than I ever imagined, even without a light source! I have the system set up near a window, but do not have a light hung over it yet. All in all, it only measures about 2'x 2' and it is incredibly easy to use. I would highly recommend this product to anyone looking to start their first hydroponic garden! I am very excited to continue growing throughout the winter!" If your garden is in a closed off bedroom or small grow room; keep the door open and the window cracked. Air exchange is a must. Plants deplete the CO2 (carbon dioxide) in the room, and fresh air must be provided, one way or another. A fan is a must... keep the leaves moving just barely, 24/7.